Los Angeles police detectives released the composite sketch of a man suspected in trying to abduct a young woman as she walked to her car near a downtown Los Angeles nightclub. “The woman had just left the Vertigos nightclub,” said Lt. Paul Vernon, who is the commanding officer of the Central Detective Division. 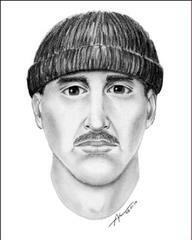 The incident occurred on January 29, 2010, around 11:30 PM near Temple Street and Fremont Street. The two women fought off the kidnapper, in spite of the hammer, and he returned to the parked car where several other Hispanic men were waiting. The men, including the suspect then drove away from the nightclub parking lot. The women described the car as an ’85 to ‘90s model, 4-door, gray-primer Toyota with a partial license plate that began with 2C_ _ _ _ _. The man appeared Hispanic, 35 to 40 years old, with medium height and weight. He had a moustache and wore a black, knit watch cap. Detectives do not believe the suspect followed the women from the club. Any who recognizes this man is urged to Detective John Arredondo, Central Robbery Unit, at (213) 972-1248. Tipsters can also call Crimestoppers at 800-222-TIPS (800-222-8477). Tipsters may contact Crimestoppers by texting the number 274637 (C-R-I-M-E-S on most keypads) with a cell phone. All text messages should begin with the letters “LAPD.” Tipsters may also go to LAPDOnline.org, click on “webtips” and follow the prompts. Tipsters may remain anonymous.